In August 2012, Jocelyn Arndt ’17 and her brother, Chris ’18, played a rock concert in front of approximately six people—including their parents and a couple of hot-dog vendors. The performance was set to be one of the last of their careers. In a year, Jocelyn would be at college; having a band would be infeasible. “We were just like, ‘Oh yeah, fun time’s over,’” Chris said. But among the handful of people there that day was David Bourgeois, co-owner of a small production company near Albany. He couldn’t believe it; the two teenagers performed in a glorified beer tent as if they were in front of a crowd of thousands. 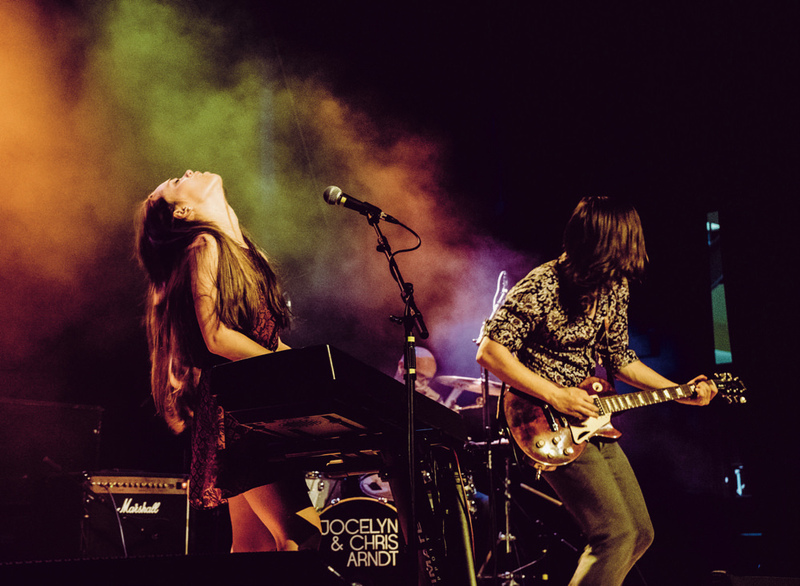 Jocelyn’s soulful voice—which has drawn comparisons to Fiona Apple and Janis Joplin—and raw intensity were stunning to see from a 17-year-old. Chris played highly technical guitar riffs in an understated, bluesy way. The two had even written some of their own songs, sprinkling them between somewhat obscure pop and rock selections from the ’80s and ’90s. After the concert, Bourgeois met with both of them and their parents. If they wanted, he told them, Jocelyn and Chris could make it as professionals. Still, before hearing from Bourgeois, the two thought their musical careers would end after high school. Their parents were both teachers. It just seemed like they’d “go to college and then have college jobs,” Chris said. A year later, Chris joined her at Harvard. They put the finishing touches on Strangers in Fairyland, their first studio extended-play record, and took a Greyhound bus out of Boston every weekend to gig around the East Coast. The proximity made it easier to write songs (“Usually really late at night,” Chris said) and plan tours. Easier, of course, is relative. During a typical week they’d leave campus on Thursday, travel for nine or 10 hours on a Friday, perform a show that night, travel another nine or 10 hours on Saturday, perform another show, and lug themselves back to campus on Sunday. Longer breaks meant more elaborate tours. Weekend homework was done in cars, trains, and hotel rooms between performances. Once, when a Chinese final was scheduled during a tour, Jocelyn went to her professor’s office a day early, completed the test, walked to the T, got to South Station, took a bus to Albany, and got on the road. Either way, it’s unique. Their newest album, The Fun and the Fight, is their most cohesive yet. You might even guess they’re siblings just by listening. Chris’s rhythm guitar playing is almost voice-like, weaving through and echoing Jocelyn’s emotional vocal lines, which can be upbeat one minute and sorrowful the next. On stage, Jocelyn often seems in a near-trance. Chris, also lost in the music, is a more serene presence.